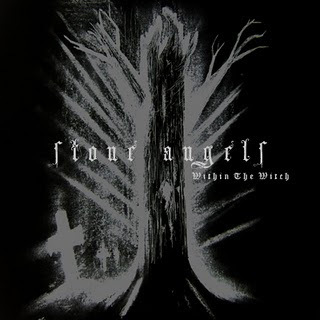 Heavy Planet : Sunday Sludge: Stone Angels - "Within the Witch"
Sunday Sludge: Stone Angels - "Within the Witch"
I always thought a fixation with death acted as a sidecar to getting older. Listening to relatives talking about "when they'll be gone" always had me wondering if I'd someday develop this same fascination and rant about nothing else. Well, here I am hitting the heart of my thirties and listening to bands like New Zealand's Stone Angels, a sludge/doom trio that's not afraid to question, accept, and embrace what most people fear. The band's debut, Within the Witch, finds parity between brooding, instrumental doom and gruff, riff-driven sludge. But whether Steven Bell is retreating to his cave in a vocal bluster or sewing himself shut so his guitar can loom, you immediately get the feeling there's something to worry about. I've always said I'm a sucker for the sound of falling rain, so The Dark struck me as the perfect way to open an album. The creeping, hovering thunder and the seep of slow doom make for a cool, ominous mood. I'll wait out this storm all day. Two other near-instrumental tracks, White Light, White Noise and Withdrawing the Jinn contain percussive vocals but no lyrics, and they effectively punctuate the album's atmosphere. White Light... is a doom/black metal pairing fit for a wet dungeon. The demon gurgle disappears and a slow reverb hum suspends this horror film score. Remaining tense and creepy, keep this one in your pocket and let the tide roll in. Withdrawing the Jinn is, on the other hand, a burning forest of dense fuzz. Taut coils unravel and guitar buzz knocks us around, riff after riff. Geoff Eyles (drums) and Mike Cheer (bass) weave a steady rhythm that has a calming effect, yet they've also mastered keeping us on edge. Stone Angels seem devoted to carrying us to our own shallow pits, but we're so comatose from the hypnotic groove that we barely notice. The band drags us to the timber and we hear a shovel striking earth on Grave. The slow doom riffs lurk, almost attempting to remain undetected. Low rumble rhythms chug and churn, growing slower and lower with each beat. Eyles' crushing medieval drums stomp as guitar licks escape falling dirt to hit the skies. Grave manages to throw in a dash of hope under the bleak, damp canopy of clouds. The album's title track is where Bell's vocals take center stage. The smear of thick, up-tempo sludge delivers on what The Dark forecast and Bell sounds like a seasoned mud merchant with his confident "gnashing teeth, reduced breathing." Cheer's low-end hits peaks and valleys, all the while grinding your knuckles on rusty gears. You'll be fine, just rub a little dirt on it. A slow drone characterizes Coffin Cross, the disc's cheerless closer. Stone Angels aren't just trying to bury us, they're also trying to keep us alive long enough to know it. What else could Bell mean with "Bony hands to claw down wood fixed in the cold ground." As cadences pick up, the mood remains dark and death-obsessed. Slow and gloomy, there's no way this album could have ended with any other track. The coffin's lowered here, and a hopeless, smoldering drone (not quite Sunn 0))), but agonizingly apathetic and lingering) welcomes a bleeding sky. Stone Angels aren't gonna pull you out of a gutter when you lose your job and develop a drug dependency. Maybe keep this disc out of your buddy's reach if he's a little on-edge lately. For all its sludge splendor, however, Within the Witch also manages to craft some haunting, melodic vistas. The band understands when to pull back and, more effectively, when to push limits. Give this one a spin once everything else in your life is stabilized. And please, don't kid yourself. Just re read this review for the first time in years! Your writing is great, thanks for the support!